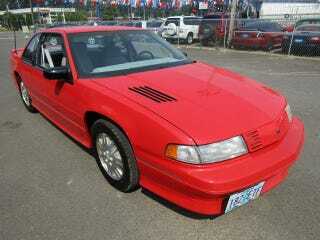 You’ll be forgiven if you never knew today’s Nice Price or Crack Pipe Lumina Z34 even existed. Given its specs and price, you might just suddenly wish that you had. Is there anything worse than being a teen? Too young to fully enjoy all the trappings and responsibilities of adulthood, but old enough that those that are already adult still expect you to carry your own water? High maintenance? Forget about it. Yesterday’s 2006 Audi A8 W12 Executive is a car that’s just entering its teen years, and at its $25,000 asking, it proved just about as engaging as that emo-looking Instagramer curled up in the corner at grandma’s 90th. A number of you felt that Audi’s value was still on a downward arc, and that it would be better to wait—maybe until adulthood?—to buy it. That opinion resulted in a 67-percent Crack Pipe loss for the big Exec. Perhaps it’s being a teenager simply means we don’t understand it? Here’s something even more quizzical—how did Chevy slip a car as interestingly optioned as today’s 1992 Lumina Z34 right under our noses without anybody ever noticing? The Lumina was introduced in 1990 in replacement of the incongruously named Chevy Celebrity. Lost in that translation was a wagon, however a two-door coupe did make the cut. That would eventually morph into the Monte Carlo. Before then, Chevy gave us the Lumina Z34, which offered up some pretty impressive kit, and maybe even a little caboodle. For most people, the name Lumina probably conjures up images of pushrod engines and faux vinyl roofs, all lined up outside of the Stuckey’s. The Z34 was a whole ‘nother kettle of fish. First off, the Z34 didn’t look like the Luminas (Luminati?) offered at the local Alamo Car Rental. These cars came with ground effects bodywork, a blanked and slatted grille piece, big ‘ole spoiler in back, and real vents in the hood. Underneath those vents lay a DOHC LQ1 V6. That was GM’s corporate counter to the Yamaha engine in the Ford Taurus. The 3.4-litre sidewinder was related to GM’s pushrod six family, but with its literal minded branding of TWIN DUAL CAM V6 it didn’t get invited to many of their parties. Here that engine made a respectable 210-horsepower. Automatic-equipped cars made do with 200, but as this car amazingly rocks a Getrag 284 five-speed, it gets the full compliment. Yep, this is a factory five-speed hot coupe with ample room for five, a sub-8 second zero to freeway speed record, and handling that’s… well, admittedly still not all that great. Regardless, we’re not here badmouth this Lumina, I’m just impressed this car has made it this far. It’s done so while looking all kinds of fabulous too. The bright red paint seems to hold a shine, and remains covered in all its in-your-face decals. Factory alloys fill the wheel arches, and those look to be in fine shape. Out back jut a pair of chromed exhaust outlets, each big enough to hide a homicidal clown. One of the coolest features of the Lumina coupe is its beer tap door handle hidden in the blacked out B pillar. I like funky door latches. These are funky and so I like them. Pretend to pour a frosty one here and you’ll be hit with a blast of nostalgia, if you’re old enough. If you’re a youngster, well, you’ll no doubt be impressed by the width of both the seats and the instrument panel. Those seats talk the talk about bolstering, but they obviously don’t walk the walk. That being said, they look hella comfortabl,e and the squished squab on the driver’s seat appears to be the only real issue on the whole car. The dash gets a toupee and it should be pointed out that this car was built before the quality of GM interiors took a significant nose dive. The dealer offering the car notes it to be as clean mechanically as it is aesthetically. It sports 130,000 on the clock, and looks to have a clear Oregon title. That dealer is asking a cool $3,977 for this warm Lumina and you now need to decide if that makes it a hot commodity. I realize that for you entire life leading up to this very morning you never even realized that you needed a Lumina. Now you just might have been hit with that epiphany and so we’ll give you a minute to collect your thoughts. Once you’ve done so, drop down and give us a vote—is this Z34 worth that $3,977 asking? Or, does that price make buying this Lumina a not so bright idea?